On Twitter last night, I came across something fascinating, via Maria at Brainpickings. (Always a source of fascinating bits.) It was an amazing visualization of the interactions of characters in the Iliad, and how they change throughout the book, by Argentinian designer Santiago Ortiz. Do click here to view the stream in all its interactive glory. And then click on “network” for a different view. Mind-boggling. I thought immediately of another graphic. A very low-tech graphic, in comparison, but one not entirely different. 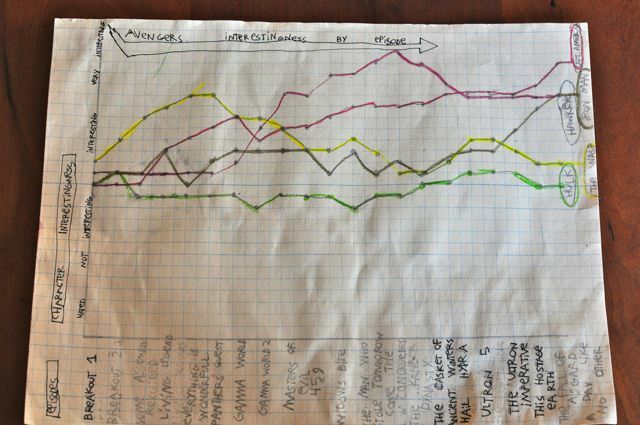 Remember the chart that Mr. T made last year, during his own fascination with The Iliad? 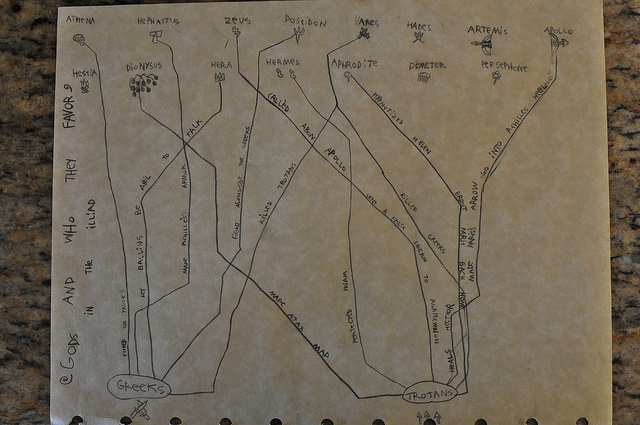 It’s a chart of the various gods in The Iliad and how they interact with one another. What’s compelling to me is that T came up with these ideas on his own. Sure, I’ve shown him lots of graphs and charts and encouraged him to think about sharing his ideas graphically. But he’s considered what he’s taking in (everything from classic literature to a superhero series–not so different in this case) and decided how to interpret it. Mostly he’s just having fun. But look at how closely his play is connected to Santiago Ortiz’ work! A year ago, I didn’t even know there was such a job as visualization designer. I hadn’t heard the word infographic. But this is the stuff of the future. All the more reason not to dismiss the likes of video games and time spent at the computer. You never know where that might take kids. More evidence of how the world is changing? As soon as I saw Santiago’s work, I wanted to contact him and share Mr. T’s work. I had a feeling he’d appreciate it. T, of course, found Santiago’s work fascinating. I contacted Santiago via email, but then we continued our conversation on Twitter. Little tweets flying back and forth between California and Argentina. Now my kid has a visual designer to follow–and a whole new future career to consider. How do we prepare our kids for that? I think all we can do is nurture our kids’ fascinations, watch the world as it changes and look for connections between the two. At least we don’t have to design a graphic visualization of those connections. But maybe our kids will. Ooooooo. I’ve been all about graphic representations, lately. These are neat, all of ’em. Good to know I’m not alone in my infographic geekiness! That is amazing! I love infographics too and am always amazed at designers’ skills in making them. I love this. T (and you) never cease to amaze me! He runs a phd department at ucsb focusing on exactly this – visualizing data- all constructed with algorithms. Maybe T will want to reach out to him. I’ll introduce you two by email. How fun! P.s. Did you know my degree was in visual design? What fascinating work that artist is doing! It just astounds me how the art and visual world is changing, and what people are coming up with. I think I’m probably more interested in this artist’s work than T would be at this point. I just like to keep up with the new media because it’s so amazing, and it helps me connect my kids with possibilities as they get older. So keep *me* up to date with what this guy is doing, please! I did not know your degree was in visual design. L should talk to you about that at some point, because she has real interest there. What a world! What possibilities! Let’s have a glass of wine and talk about it all! I love that you were able to share T’s work with a kindred adult spirit doing similar kinds of imagining and visualizing! What a cool connection. I’ve been thinking about you lately and your encouragements to be open-minded about computer time and non-traditional ways of communicating. As I’ve mentioned to you before, my B. has been playing a lot with Scratch, the computer programming site for kids, trying so hard to create a video game that works–not easy at all. And guess what? My “non-writer” is taking baby steps into writing through Scratch. He’s posting comments on other kids’ work, having to figure out how to write words for computer code scripts, and generally immersing himself in a use of language and logic that is totally new and foreign to me. Exciting and unnerving at once, but mostly exciting. Thank you for helping me be comfortable with what he’s doing and not demonize it as “too much screen time”–though my own Waldorf guilt does kick in occasionally, it’s getting better all the time. How fantastic, Carrie! It’s what you always hear: kids who aren’t forced to write will choose to write when they develop an interest that requires it. I’m excited for both of you! Thank you so much for sharing this with me. It would be great to see a map showing the connections between Avengers characters – maybe an idea for the next project! We had fun looking at your website together, and seeing how complex and stunning graphs and charts can be. Thank you for taking the time to encourage T. It means a lot to both of us! Holy cow, Santiago, that was amazing! I actually teared up when Jer showed the data point of when he met his girlfriend. What a fascinating world the two of you work in. I’m awed, and so grateful to know this world is out there, and to be able to share it with my son. Thank you for making yet another fantastic connection for us. Wow about some of those links. When I was a kid we used to graph our scores, playing 5-handed 500. And whoever had the most severe ups and downs got to claim having had the most fun, regardless of who actually won.